In the last five years, the Aligarh Muslim University has faced a series of rhetorical questions from India’s Hindu Right-wing groups. The sedition case against the Aligarh Muslim University students did not come out of the blue. And, it probably did not just arise from one incident with a Republic TV reporter either. In the last five years, the Aligarh Muslim University (AMU) has faced a series of rhetorical questions from India’s Hindu Right-wing groups. The obvious agenda behind these questions is to vilify a Muslim-majority university as an unpatriotic, India-hating hub of Jinnah supporters. Why does the Aligarh Muslim University have to have the word ‘Muslim’ in it? Why does AMU have to hang a decades-old portrait of Mohammad Ali Jinnah in its students’ hall? Why can’t the university not have a temple on its campus? Are Hindu, vegetarian students at AMU served food, which is cooked in the same oil as meat? Against this backdrop, the sedition complaint against 14 of its students, which now the police say could be withdrawn, just before the Lok Sabha election is no surprise. It fits perfectly within the framework of the systematic targeting of the 99-year-old university that was set-up as a response to the Muslim awakening movement, with financial contributions from several Hindu maharajas and a nizam. But its illustrious and progressive history is of little use when it comes to the politics that surrounds it today. The ruling BJP — its MP in Aligarh and its youth wing — and the Sangh forces have quietly spread their tentacles in a university whose politics has been essentially antagonistic to theirs. In 2017, candidates backed by the RSS showed better electoral performance for the first time on the campus. So, how exactly did they manage this in just five years? Hindu Right-wing students on the campus say that with “their” government in the state and at Centre, they feel emboldened to finally speak up against what they see as a “regressive, homogeneous and bigoted culture” at the university. Their sense of support is not unfounded. The BJP MP from Aligarh, Satish Kumar Gautam, has been at the forefront of the attempts to demonise AMU. In 2014, he declared that if the university celebrates its founder Sir Syed Ahmed Khan’s birth anniversary every year, it must also celebrate the birth anniversary of Jat ruler Raja Mahendra Pratap Singh, “a generous contributor” to AMU, with the same gusto. The intention was clear: provoke and polarise on religious lines. Gautam has now said that the university should drop the word Muslim since it sounds “harsh”. Much like the case with JNU, the anti-AMU rhetoric too is designed to permeate the national political debate. When MP Gautam raked up the issue of Jinnah’s portrait in AMU’s student hall, it made national headlines with Uttar Pradesh chief minister throwing his weight behind him, and television channels broadcasting the news on prime time. But it is not as if the students at AMU have proven to be the torchbearers of tolerance. Last year, when President Ramnath Kovind was scheduled to travel to AMU for the convocation ceremony, several students protested against his visit, vowing to disallow him from speaking. Their grouse with him dated back to a statement he reportedly made in 2010 describing Islam and Christianity as “alien to the nation”. This time around, the exact details of what transpired between the Republic TV reporter and the AMU students are not known. If the reporter is to be believed, she was heckled by the students. That, if true, would be unacceptable, even if it is far from being seditious. 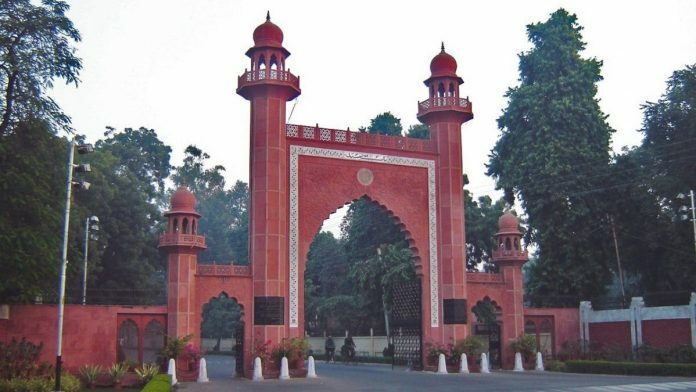 As both sides continue to trade allegations, one can expect AMU— a university whose “Muslim-ness” has never been more conspicuous — to remain in the news for all the wrong reasons until the elections. And, until its middle name is firmly etched in public consciousness as its first name.